The city of Coachella, California is nearly 29 square miles of desert, located 68 feet below sea level and 130 miles east of Los Angeles. 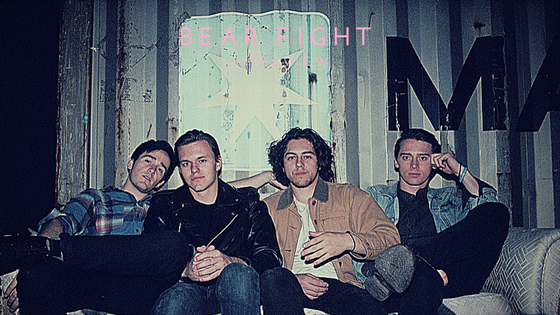 Although it is home to the 78-acre Empire Polo Club – the host of the infamous Coachella Valley Music and Arts Festival – it is also home to a four-piece indie/rock band by the name of Bear Fight. While Ramirez and drummer Ryan Cenicola have been friends since they were toddlers, their group – including guitarist Evan Boydstun and drummer Matt Sutton – have known each other since high school. After discovering one another’s love for playing music, jamming together was a no-brainer. By having the influences of the festival on their side, learning about the industry early on is what helps them stand apart. By not pigeon holing themselves, they’ve been able to release two tracks this year that abide by that timeless theme they’ve tapped into. “She” originally came from a poem and was put to three chords in a means to be short, simple and powerful. Written around the same time was “Harlem”, a song with vintage past and present. As news of a record release anxiously awaits those who have heard the two tracks, Bear Fight continues to test the boundaries between genres. These four friends have something unique on their hands, and it’s only a matter of time before the rest of the world tunes in to see what’s next.